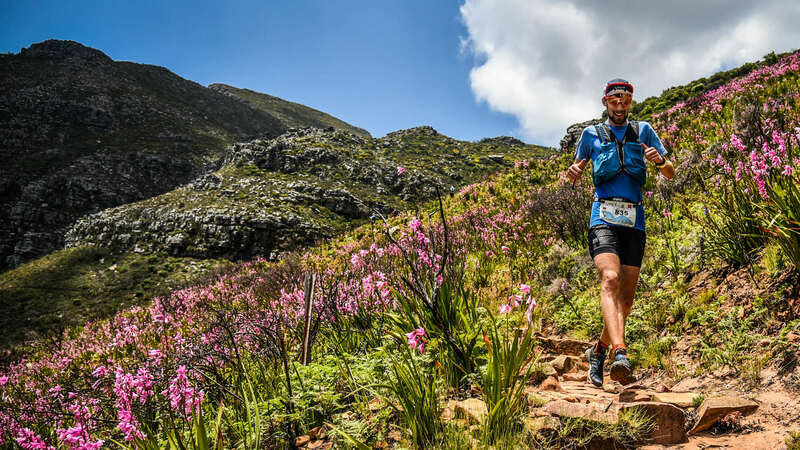 I still don’t really know, why my first ultra trail run at Ultra-trail Cape Town - UTCT turned out that well, but in the following lines I’ll try to analyze and understand it. 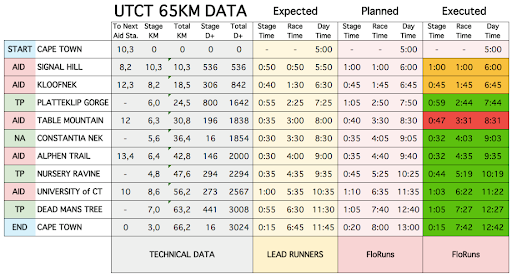 My preparation for the UTCT went quite well. Yes, I could have started earlier. Yes, I could have spent more time on the trails, if there hasn’t been the injury. But, nevertheless, it was very solid. Those who read about my preparation know what I’m talking about. Going into the race, the biggest unknown was the distance as well as the nutrition. How would my body respond to such a long physical, but also mental, strain. How would my stomach cope with the stuff I eat and drink? And how much do I have to drink and eat? Questions over questions! 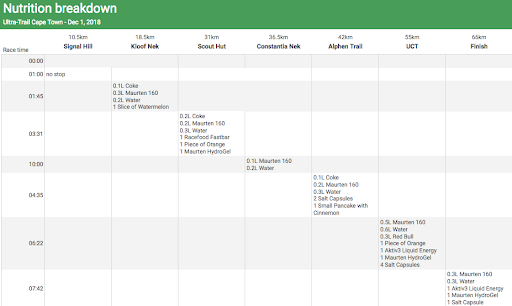 Nutrition intake at the respective aid station as well as on the way there. Running such a long distance and over such a long time, the nutrition is a key factor. That’s not a lot of food for almost 8h of physical activity! Only a few gels, but no real food. Why only that little? Well, first of all, I felt fine with this amount. And secondly, I didn’t feel like eating proper food at all. For instance, the Racefood bar, which I ate on the Kloof Corner climb and up Platteklip, was stuck in my mouth and neither was it easy to chew while breathing. And, looking at the total amount of carbohydrates my nutrition contained, it’s actually not that little anymore. Additionally, if you put it into relation to the expended calories, it looks quite reasonable as well. According to my Garmin Forerunner 735XT, I spent 5’726 calories over the entire race distance. 1g of carbohydrates equals 4g of calories, so I consumed in total over 1’500C only during the race (neglecting proteins and fat entirely). However, I obviously already consumed a lot of calories the evening and morning before (1.8 Margeritha pizzas = 1’400C). Overall, I’d say, the nutrition strategy - if you want to call it a strategy, as I actually never thought about these numbers before the race - turned out quite well. My race strategy was easy. Run as you feel and in the best case you hit the planned times at the aid stations. The main goal was to finish. Additionally, I was hoping for a sub 8h. That is quite ambitious for the first ultra, especially on this route, but I believed it would be possible if I have a perfect day. Obviously, I had thought about the splits for the different sections beforehand. However, I never noted them down on my arm or elsewhere, so I didn’t really remember them during the race. On top of that, I decided to change the GPS mode of my watch the day before, in order to safe battery. This lead to a disaster in terms of distance, as it added 20km in total during the day. Due to that, I barely looked at my watch during the race. I simply ran as I felt. I took my time in the aid stations and on the ascents and pushed a bit more on the flats and downhills. Comparison of lead runner expectations, my planned splits and the actual splits including the technical route data. Even though it didn’t feel that way, but looking at the statistics now, I was surprisingly gaining minute by minute towards the end of the race. Looks like my pacing and nutrition strategies work out very well, without thinking too much about it beforehand. So what’s my verdict? Was it a big surprise that I ran my first ultra without a bad section? After looking closer at the statistics and nutrition facts, I’m not that surprised anymore. Firstly, I had a very solid build-up with sufficient mileage as well as good back-to-back runs and technical terrain doesn’t bother me a lot. Secondly, my nutrition was also on point. Even though it doesn’t look like a lot at first glance, it still contained a lot of energy and covered my energy expenditure. Thirdly, at the beginning of the race, the weather was also in my favour. Fifthly, I cooled my body sufficiently with ice and water from the aid stations as well as the streams on the route, in order to defeat the heat. It was a well executed race on a day, where everything came together for me! Final top15 of the 65km race. My splits at the official timing points. 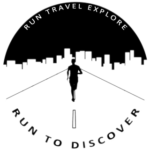 Next PostUTCT 65 - "I am an ultra runner!"